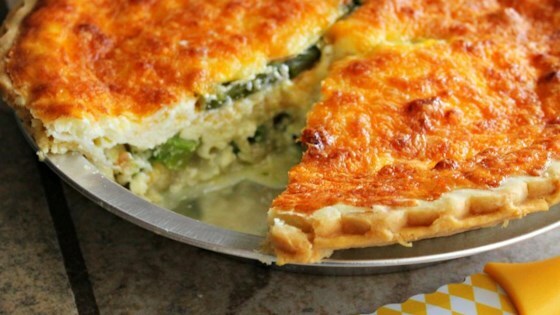 "This recipe uses a store-bought pie crust to save time. Prep time is about 15 minutes." Pour egg whites, eggs, and cottage cheese into a blender; pulse several times to mix and blend until smooth, about 1 minute. Heat 1 tablespoon olive oil in a large skillet over medium heat; cook and stir asparagus and onion until asparagus is tender, about 8 minutes. Heat 2 teaspoons olive oil in the same skillet over medium heat. Season shrimp with salt and black pepper; cook in hot oil until they turn pink and are no longer translucent in the center, 5 to 8 minutes. Fit pie crust into a 9-inch deep-dish pie plate and spread shrimp into the crust; top with asparagus mixture. Pour cottage cheese mixture over vegetables and shrimp. Spread Monterey Jack cheese over the top of the quiche. Sprinkle green onions over cheese. Bake quiche in the preheated oven until cheese topping is lightly browned and the quiche is set in the center, about 1 hour. There is no list of ingredients or recipe. How can we make or review this? Easy, tasty; my go-to for guests.. I made my own crust which is terrific so added to the great dish. Having it again as left over.